Just watched the news (I'm surprised mainstream media actually showed something important for once) and they showed a video of almost 200 Syrian soldiers being excecuted by IS. 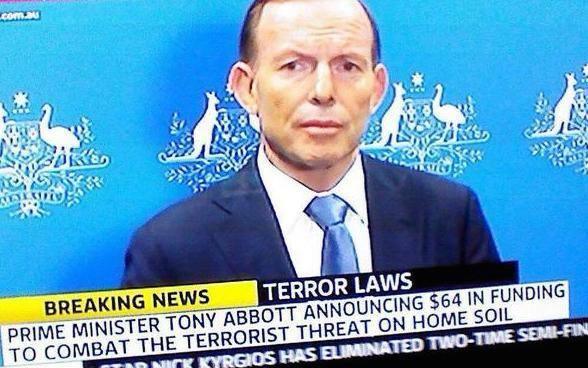 Because no terrorist shall ever live after Abbot has his way! Note: the issue actually is closer to them having not given the moderates weapons while they had a reasonable chance of success. Trust me, there is no such thing as moderate rebels, and there never was. Syria has always had 2 choices; facists that treat people equally with secular beliefs but rule with an iron fist, or rebels who want democracy yet can't tell the diffrence between islam and government. Personally, I'd take facists over islamists any day. I actually was in Syria 8 years ago, I felt completely safe there and only had good memories of it. The status quo should not have changed, atleast not this way :/ I predicted all of this, and so did everyone else who knows anything about how the middle east works. Arming/funding rebels and terrorists caused this. Isis is about a mile (less than 2km) away from Baghdad. mini0013xx wrote: Isis is about a mile (less than 2km) away from Baghdad. That is interesting... wonder if those sorry excuses of soldiers that the US spent millions of dollars to train and arm will finally do their duty then, or if they're just gonna toss their guns and run like they did before. If they take Baghdad it's going to change the whole sitiuation..
That is very disrespectful, those soldiers put their selves in harm's way to help their country. Don't insult the people who are trying to help. Normally I would agree. But let's not forget that in the beggining of all this ISIS called the local military and said that they were going to attack, but instead of getting ready the Iraqi soldiers changed out of their uniforms and ran with their tails between their legs. They allowed terrorists to take control the second largest city in Iraq, left them all of their weaponry and abandoned the civilians to die or worse. And for months after they just let ISIS grow in strength without doing anything AT ALL. If they would have done their duty then and there and defended Mousul like they should have, ISIS would possibly still be just another minor terrorist group, instead of arguably the most powerfull terrorist organization in the world. ISIS is getting pushed out of Kobani! mini0013xx wrote: ISIS is getting pushed out of Kobani!